One of the most endearing things about Liverpool Playhouse’s Christmas offering, The Star, is the clear love that its writer, Michael Wynne, has for the history of theatre. Music hall plays an important part in that history, most notably as an avenue for the working class into venues such as The Playhouse. There are references to this throughout the play with a crowd pleasing working class versus greedy capitalist through line. Though this is certainly not a play that takes itself too seriously. The Playhouse is actually a former music hall itself, starting life as the Star Music Hall, from where the play gets its name. And with the establishment set to mark its 150th anniversary, what better way to celebrate than to go back to the beginning? 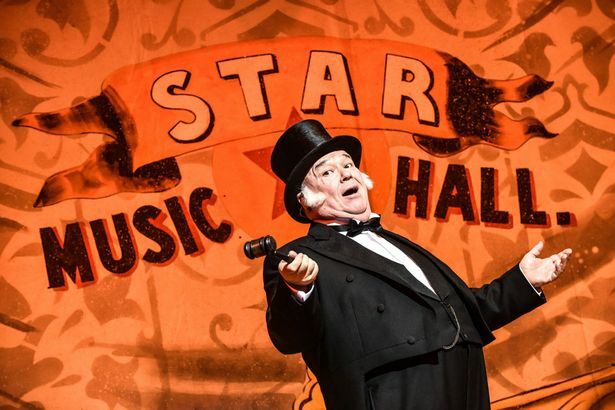 The first act rolled along smoothly with many much-loved numbers, the best of which being ‘Champagne Charlie’ sung by Mr Charles (Kevin Harvey), the evil capitalist, complete with maniacal laugh, who has come to turn the Star into a ‘ye olde Bargain Booze’. Much of the comedy was quite self-referential which seemed slightly at odds with the blithe tone of the show, and after a while this incessant irony became rather irksome. But there were a lot of genuinely funny moments, and the crowd laughed loudest at the same over-the-top, nudge-nudge euphemisms they would have been laughing at over a century ago. The second act held more of the same, starting off strong with a nautical medley consisting of ‘She Sells Sea Shells’, for which an enormous sing-a-long banner was rolled down. The spot light bobbed along the words and I couldn’t see anyone not singing. This was followed by the best song of the show, ‘I Was a Good Little Girl Till I Met You’ sung by the sultry Ida Valentine (Michelle Butterly), a song I’d never heard before but quickly fell in love with, the kind of song that belongs on the stage. Although it is clearly not the aim of the play to meticulously recreate the feel of being in a music hall, the moments that it does come close to achieving this feat are when Michelle Butterly is performing on her own. She emanates the essence of the era. The visual aspects of the play were very striking. The distinct aesthetic of the period was successfully recreated with spectacular outfits and beautiful backdrops painted with old-timey arabesques. Following a second act lull the crowd pulled together for the last couple of numbers. Dame Ellen’s version of ‘The Boy I love Is Up in the Gallery’ was actually quite moving in a strange sort of way. ‘That was a bit of a downer, wasn’t it?’ asked Ida, with perfect comic timing. So they finished with a jolly one and everyone walked out in high spirits, muttering praises. Despite some slightly dodgy dancing that confused the line between supposed to be bad and just bad, and few other minor niggles that I’m sure will be smoothed out as the production gets into its run, this is a very charming play, and the perfect antidote to that inescapable Christmastime cynicism. One of the most endearing things about Liverpool Playhouse's Christmas offering, The Star, is the clear love that its writer, Michael Wynne, has for the history of theatre. Despite some slightly dodgy dancing that confused the line between supposed to be bad and just bad, this is a very charming play, and the perfect antidote to that inescapable Christmastime cynicism.